KAIJU ONE is ready to release their BIGGEST soft vinyl of the year! Marking the end of 2017 where they left off at the start of 2017, with a huge BANG. 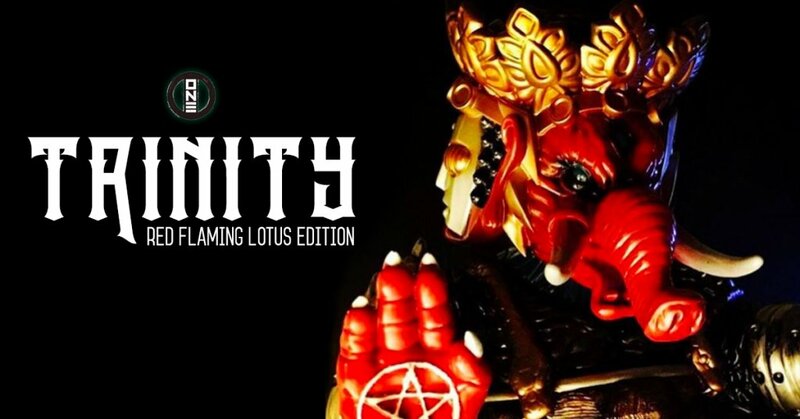 KAIJU ONE presents to you 三不像 赤焰紅蓮配色 TRINITY Red Flaming Lotus version. Standing at a proud 13.5 inch worth of soft vinyl. A multi-faced figure for all the looks you need. Limited to 30 pieces Kaiju One has launched a Lotto sales TODAY! Lottery Sales will start from 20 Dec 2017 ( NOW ) to the end of 24 Dec 2017 ( Hong Kong time ) Winner will be informed by 26 Dec 2017 ( The Boxing Day). The result will be sent to winners by 26 Dec 2017 through email. Winners qualification will be cancelled if there is no settlement within 3 days of the announcement. Toys will be shipped out by 30 DEC 2017.